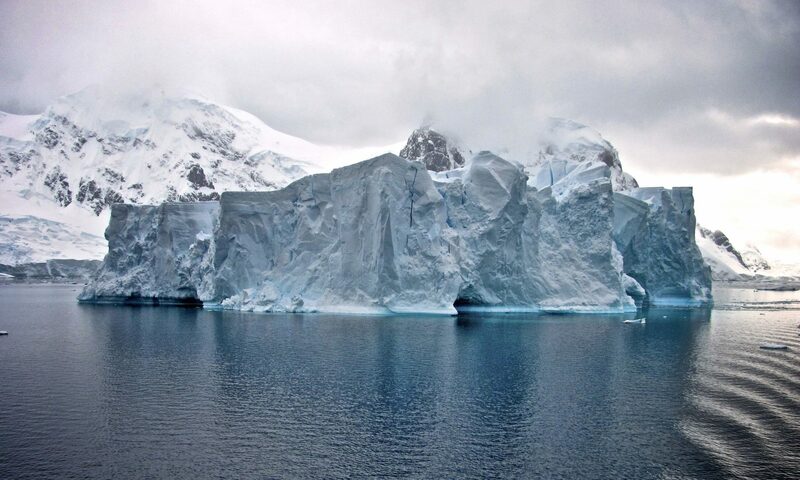 Antarctica differs from the Arctic – its polar opposite – in topography, ecology, and history. A vast continent, it is covered by ice up to three-miles thick (4,572 m) in some places. The Southern Ocean surrounding Antarctica connects with the Atlantic, Pacific, and Indian Oceans. Its nutrient-rich waters support an ecosystem teeming with life. Human history is shorter in Antarctica than in the Arctic. Indigenous peoples never lived here. Seaman in search of whales were the first to venture into the region. They were followed by explorers, scientists, and artists. The mean temperature at the South Pole is –58°F (–50°C) versus the North Pole, which is a balmy 0°F (–18°C). “If you were standing at the South Pole, you would be at an elevation of 9,300 feet above sea level (that’s how thick the ice is there) and 800 miles from the moderating influence of the ocean (i.e., a continental climate). If you were standing at the North Pole, you would be on an ice floe about 6-10 feet thick floating in the middle of the Arctic Ocean, which is about 13,000 feet deep there (i.e., a maritime climate). Top banner image: Map of Antarctica, (Landsat Image Mosaic of Antarctica), US Geological Survey, National Science Foundation, National Aeronautics and Space Administration, and the British Antarctic Survey.